Embark on a journey to embrace brokenness as a gift---and discover a deeply meaningful life! With her trademark poetic stories and soul-searching reflections, Voskamp offers 60 devotions inspired by The Broken Way to help you replace a self-weary existence with a more Christ-focused way of living. Each reading includes Scripture verses and thought-provoking questions. As Ann Voskamp writes, “great grief isn't meant to fit inside your body. It's why your heart breaks.” And each of us holds enough brokenness to overflow—to be given as the greatest story of our lives. As Ann writes, "The wound in His side proves that Jesus is always on the side of the suffering, the wounded, the busted, the broken." Discover how surrendering in unexpected ways is the first step toward receiving what you long for. Discover the good news that your beauty is not in your strength but in your fragility. Discover why your healing shines radiant through your wounds—and how only in brokenness will you ever be whole—and find the way to the abundance you were meant for. 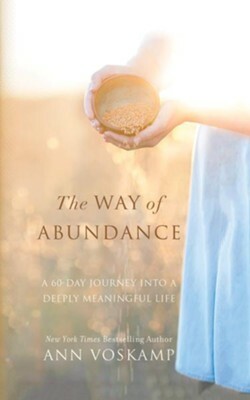 I'm the author/artist and I want to review The Way of Abundance: A 60-Day Journey into a Deeply Meaningful Life - unabridged audiobook on CD.